The Accounting and Corporate Regulatory Authority (ACRA) of Singapore continuously reviews the regulatory frameworks governing the companies and businesses registered in Singapore and makes necessary amendments to ensure the relevance, ease of application and efficacy to uphold the country’s competitiveness as a regional business hub. In line with this trend, ACRA has made changes to the statutory requirements governing the holding of Annual General Meetings (AGM) and filing of Annual Returns (AR). The timelines for holding AGM and filing AR have now been aligned with the Financial Year End (FYE). Specific safeguards have been introduced for private companies exempted from holding AGMs. The process of filing annual returns for the solvent Exempt Private Companies (EPC) and Dormant Companies has been simplified. The changes will take effect on 31 August 2018. The following is an overview of the changes. 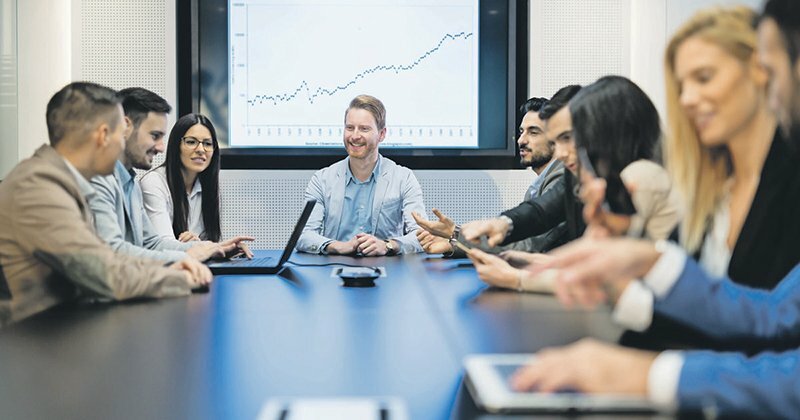 Presently, Section 175 of the Companies Act requires directors of every locally-incorporated company to hold its first AGM within 18 months of incorporation and subsequent AGMs at intervals of not more than 15 months. Section 201 of the Companies Act requires financial statements tabled at AGMs to be made up to a date within 4 months for listed companies or 6 months for not-listed companies before the date of AGM. As per the changes, the timeline provided in section 201 is aligned with the FYE of the filing company. Accordingly, listed companies will have to hold their AGMs within 4 months after the FYE and other companies must hold their AGMs within 6 months after the FYE. The new provision is stated in section 175 and section 201 and its accompanying provisions on application for extension of time for laying of financial statements are scrapped. Presently, Section 197 of the Companies Act requires every locally- incorporated company to file the AR within 30 days after its AGM and companies having a share capital and keeping a branch register outside Singapore to file the AR within 60 days after its AGM. As per the changes, listed locally incorporated companies are required to file the AR within 5 months after their FYE and the same is 7 months after the FYE for not-listed companies. In the case of companies having a share capital and keeping a branch registered outside Singapore, the time for filing AR is 6 months after the FYE for listed companies and 8 months after the FYE for not-listed companies. It must be noted that AR can be filed only after an AGM has been held; or in the case of companies that have been exempted from AGM, only after financial statements have been sent; or in the case of private dormant companies that are exempted from preparing financial statements, after the FYE. The timelines have been aligned with the FYE to simplify and ease the compliance procedure for the companies. Prior to the change, the due dates for holding AGMs and filing ARs were unclear as notification of FYE was not mandatory. Now, with the FYE notification becoming mandatory, companies will have to hold their AGMs and file the AR within 6 months and 7 months respectively. So, the changes not only simplify compliance, it also establishes predictability and clarity. The following safeguards are in place to prevent companies from arbitrarily changing their FYE to circumvent compliance requirements. Companies must obtain approval from the Registrar if they wish to change their FYE after having previously changed the FYE within the last 5 years, or if changing the FYE would result in a financial year longer than 18 months. Unless otherwise allowed by the Registrar, the duration of the financial year must not be longer than 18 months in the year of incorporation or any year in which there is a change in FYE. 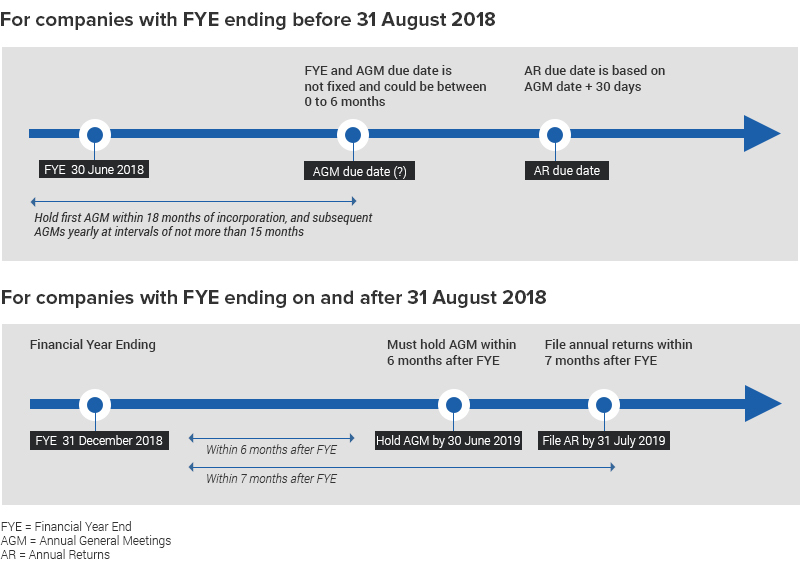 Only FYE of the current and immediate previous financial year may be changed (provided that statutory deadlines for AGM, AR and Financial Statements have not lapsed). As for the newly incorporated companies, who have notified their FYE to the Registrar, the anniversary of the notified date is deemed to be the FYE. In the absence of a FYE notification, the date on incorporation is legally deemed to be the FYE. Companies that wish to change their FYE may apply to the registrar via the transaction ‘Change of Financial Year End” to change the FYE. Likewise, companies that have abnormal FYEs can notify the Registrar of the same to avoid seeking approval from the Registrar every year. Presently, section 175A of the Companies Act allows private companies to dispense with holding AGMs if all members approve to do so. To reduce the compliance burden on private companies the following to broaden the situations under which a private company need not hold an AGM have been introduced. The newly introduced conditions could also be regarded as safeguards to prevent companies from flouting regulations. No member requests for an AGM to be held at least 14 days before the end of the sixth month after the FYE. However, if any member notifies the company to hold an AGM not later than 14 days before the end of the sixth month after the FYE, then the director of the company must hold an AGM within 6 months after the FYE. In case, if the director is not able to meet the deadline, he may obtain the approval of the Registrar for an extension of time to hold an AGM. If any member or auditor requests for an AGM within 14 days after sending the financial statement then an AGM must be held and the Registrar must be notified of the AGM held. It must be noted that requirement (1) does not apply to dormant relevant companies that are exempted from laying financial statements under Section 201 for a financial year pursuant to Section 201A. Unlike the present 30 days after the AGM requirement, the changes require companies to file the AR within 7 months after the FYE. Presently, in companies that have dispensed with AGM, a member can request for an AGM before 3 months of the FYE, but now a member can request an AGM at least 14 days before the end of the sixth month after the FYE. If the dispensation resolution of the members ceases to be in force, according to the revised requirement, the AGM must be held if at least 3 months remain to the AGM due date unlike the present requirement to hold AGM if at least 3 months remain in the financial year. While expanding the scope of the dispensation of AGM by private companies, the safeguards also uphold the interest and rights of the members of the companies and ensures consistency. (b) the company is not required to file financial statements with ACRA. In the changed regime, ACRA will pre-fill most of the information in the AR Form; thus, simplifying and improving the ease of the filing process for the solvent EPCs and Dormant Relevant Companies, which need to only select the available options and dates indicated, and verify that the information is correct before submission. Solvent EPC is a company gazetted as an exempt private company or a private company which no beneficial interest in its shares is held directly or indirectly by any corporation and which has not more than 20 members; and the company confirms that it is able to meet its liabilities as and when they fall due. A Private Dormant Relevant Company is a private company which is dormant; is not listed (or not a subsidiary of a listed company); and has total assets less than or equal to $500,000 (consolidated value if it is an ultimate parent). We are experts when it comes to Singapore’s company laws and regulations. Thousands of companies rely on us to fulfill their annual compliance requirements.